Edmund Welles: the bass clarinet quartet – Cornelius Boots – Shakuhachi Master & Woodwind Composer – Bamboo Gospel & Hermetic Musicology. Zen, New Music and Bold Creativity. Photos from our 2014 micro-residency in Ashland, Oregon. Go to edmundwelles.com for all things Edmund Welles, except for studying the vast library of bass clarinet quartet compositions, in which case you should head to Bass Clarinet Quartet Compositions on this website. See the “brief history” overview at the Armchair Metaphysics Blog. Edmund Welles has the distinction of being the world’s only original, composing band of four bass clarinetists, they invent and perform heavy chamber music. The bass clarinet has a 5 octave range and a huge span of tonal, melodic, and rhythmic capabilities. Since 1996, Cornelius Boots has led and composed for Edmund Welles, which received a Chamber Music America Grant in 2004 for the creation of Agrippa’s 3 Books, a multi-movement work inspired by occult philosophy and heavy metal music. This piece is featured on their debut album of the same title [mixed and mastered by Grammy-award winning sound alchemist Oz Fritz]. The album made the Top Ten Albums of 2005, and the New York premiere of the piece made the Top Ten Performances of 2005 in All About Jazz NYC. In 2007, The Yerba Buena Center for the Arts in San Francisco commissioned the group to compose and perform 2012: A Requiem for Baktun 12, the 13th and Final Cycle; and another Boots composition for the quartet, Tooth & Claw, placed 2nd out of thousands of entries in the “Instrumental” category of the 2006 International Songwriting Competition. This is the title track of the group’s second full-length album, released in October 2007. 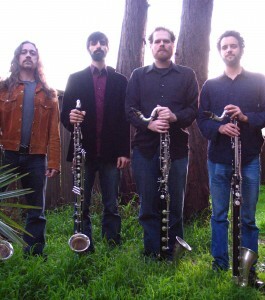 In 2008, the quartet was a featured ensemble at the International Clarinet Convention in Kansas City in addition to sharing a bill with the innovative “rock against rock” power-ensemble Sleepytime Gorilla Museum at several California venues. As their influence grows, Edmund Welles continues to be sought out for cutting edge music festivals and series including Three Drops of Blood (Installments II and IX), Switchboard Music Festival, and Hornucopia. There have also been several acolyte bass clarinet quartets (such as Acid Bass in New York) crop up around the globe over the last 3 years, playing both Edmund Welles arrangements and innovative pieces of their own. Engendering enthusiasm and expanding the musical horizons of both clarinetists and the general non-clarinet-playing public is at the core of the ensemble’s existence. In 2011, Edmund Welles shared the stage with Medeski, Martin, and Wood on all of the California dates on their 20th anniversary tour. They were featured at the 2011 Clarinetfest at Cal State Northridge with a performance in the shiny new and opulent Valley Performing Arts Center. Their 3rd full length album, Imagination Lost, was released in August and features original compositions of adventurous intent and epic scope in addition to some short pieces and an Iron Maiden song featuring guest vocalist Gene Jun (Idiot Flesh).